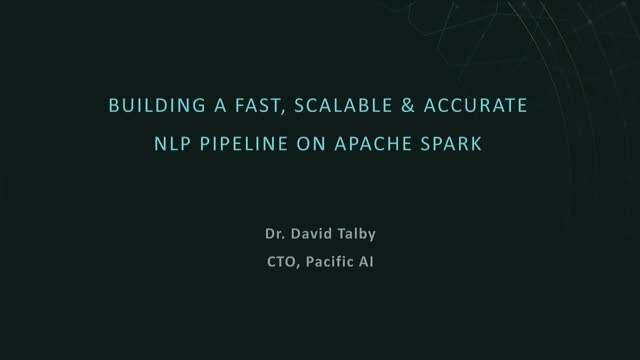 This talk introduces the NLP library for Apache Spark. It natively extends the Spark ML pipeline API's which enabling zero-copy, distributed, combined NLP & ML pipelines, which leverage all of Spark's built-in optimizations. The library implements core NLP algorithms including lemmatization, part of speech tagging, dependency parsing, named entity recognition, spell checking and sentiment detection. The talk will demonstrate using these algorithms to build commonly used pipelines, using PySpark on notebooks that will be made publicly available after the talk. David Talby has over a decade of experience building real-world machine learning, data mining, and NLP systems. He’s a member of the core team that built and open sourced the Spark NLP library.